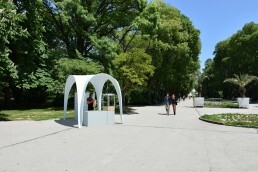 Devnya Cement AD announced a competition to build a trading pavilion constructed with glass reinforced cement, in the sea side park of Varna, Bulgaria. We proposed an extremely thin shell, 2cm thick at its minimum. 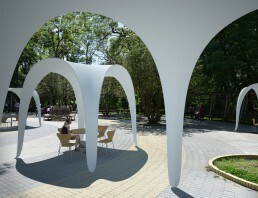 The pavilion consists of four leg-shaped modules combined together. 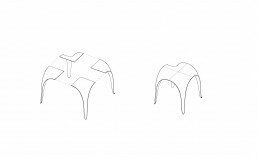 The thinness makes the modules lightweight, which maximizes mobility. The geometry of the shell creates a gradation of shadow on its surface. 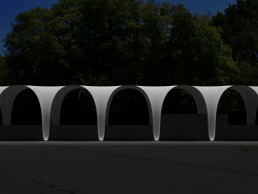 With night-time lighting, the surface stands out vibrantly, creating a unique play of light and shadow.